Developing the logo was such a fun process. Once I had got it in my head that it had to be the Diwani Jali script, began the task of explaining what was in my head to Raashid Seyal, a calligrapher based in Multan, Pakistan. I’m so grateful to him for doing such a superb job of translating my ideas onto paper and giving me exactly what I wanted. It was another sweltering hot July day when we visited Hussain Chandio in is studio. But the hospitality and kindness we were shown made up for it. It was fascinating to see the canvases at their very inception and to learn the process involved in getting from there to the finished composition. It was such an honor to meet A. S. Rind. He was gracious and kind, and we talked of many things: art and philosophy and the symbology in his work, and what he is exploring next in his newest series. All this, and a poet too! 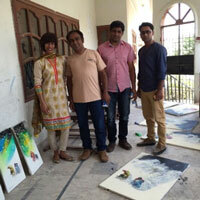 Hanging out in Wasi Haider’s studio. 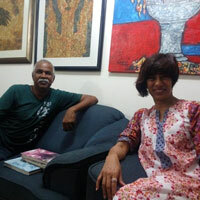 I remember it was a sweltering hot July day, but being surrounded by all his amazing art was exhilarating nevertheless. One, but not the same! 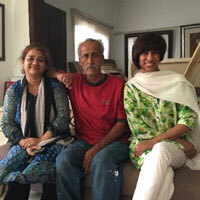 Momin Khan, in his studio. We had been looking at some amazing canvases with his signature horse-riders, and all of a sudden I saw this riot of color peeking out from behind one of the canvases. I pulled it out and instant love!